Modern travel is a search for WiFi. Everyone’s at it wherever you go, to the extent that restaurants frequented by travellers often have the WiFi password on the menu. To some it might seem sad to see device addiction like this, but they would be wise to remember; blogging, posting and updating social media accounts is merely the modern version of the travel diary. Except it’s much more expensive, both monetarily and security-wise; using Wi-Fi hotspots at hotels and restaurants – especially for those on business travel – are high, with hackers able to intercept anything sent over unsecured networks. Cue Cellhire, which rents out a phone-sized Samsung-made MiFi device that’s fitted with a data SIM card bundle specific to a country or countries you’re travelling to. Cellhire is a British company that supplies such bundles to travellers/tourists, sports participants and major media companies at sporting events such as the Olympics, FIFA World Cups and the Euro Finals, and the Cannes Film Festival. The device is very easy to use. After putting the SIM into the MiFi and switching the device on, you look for a WiFi connection on your phone, tablet or laptop, enter the code printed on the front, and you’re in. No advertising screens, tick any boxes or the need to give over any personal email addresses or other details. It also allows up to eight devices to log in to its connection simultaneously to share web access, which makes it ideal for families or colleagues travelling together on work trips. The advantage is that instead of using WiFi or your own phone’s connection, you’re using pre-paid, unlimited and mobile phone network connectivity – likely to be 3G or 4G. As a speed comparison, I logged into the free WiFi at Las Vegas airport It was fast enough for most stuff I needed to do, though during the work session I needed to download a whopping big 484MB file. I began, but the 42 minutes made it seem like a job that was just too big. So I switched-on the MiFi, which in the USA uses a T-Mobile SIM card. My laptop swapped to the MiFi’s network immediately. And how long did that 484MB take? Three minutes. Battery power is potentially where MiFi gadgets fall over, though in our week-long test it never did run out while we were using it. Battery last about three hours, so you do have to be a bit careful if you’re at a conference or similar, not to hammer it all day. 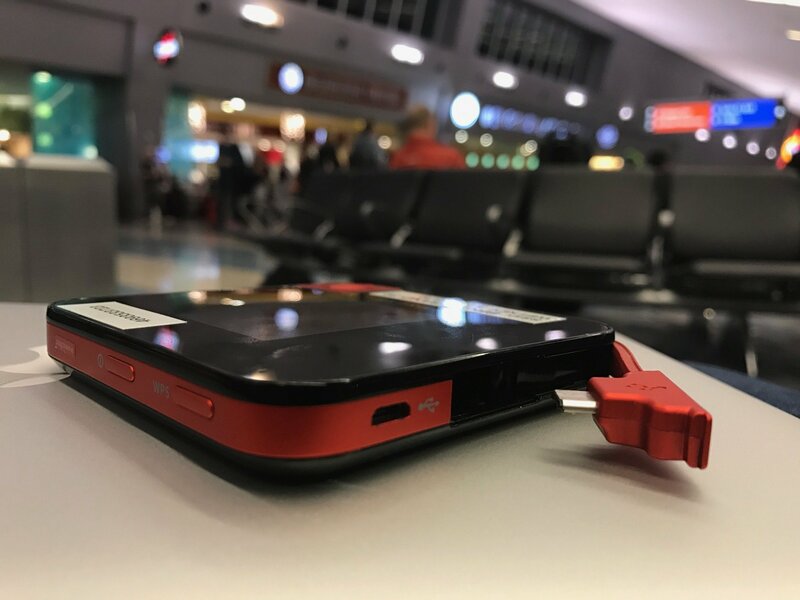 Still, it’s easy enough to recharge from the same power pack you probably travel with to keep your smartphone juiced, all done via microUSB. OK, so it’s not always cheap – and data comes in pre-paid chunks – but you can get an International MiFI from UK£18.99 and European MiFI from UK£19.99 for 30 days, which isn’t bad. Dig down and the prices are higher – such as the European 1GB package, which costs £39.99 and the most popular, the European 10GB, at £89.99, though these are largely 4G access deals. My USA 5GB deal cost £72.99 while Hong Kong 15GB is a very reasonable £66.99. Each one carries an extra £10/£19 for a 3G/4G MiFi, and a £10 deposit.